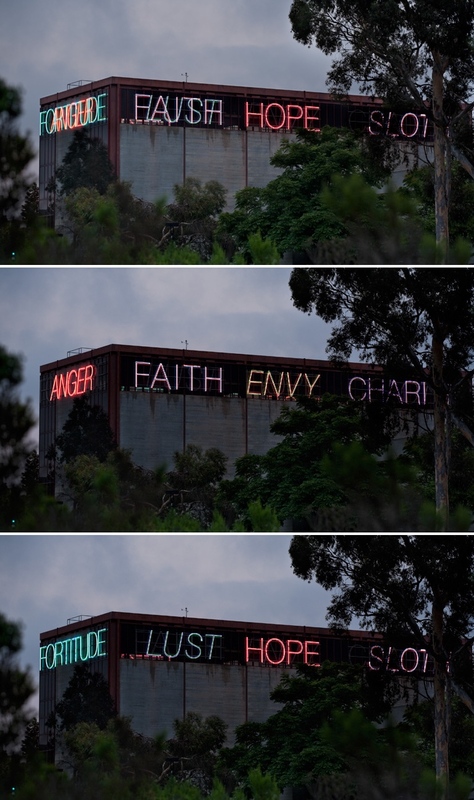 Vices and Virtues is pretty much exactly what it sounds like, written in really big, neon, flashing letters around the top of a building on the campus of UC San Diego. The great part about this piece is that everyone can connect to it because virtues and vices are pretty much the only things that are universal…that and death, of course. The fact that the vices circulate faster doesn’t not mean anything. The vices most likely outweigh the virtues but who’s counting (besides Bruce Nauman)...ya filthy animals. The words are written in 7-foot-tall lettering with almost a mile of neon tubing. You can imagine that when the piece was proposed, people whose bedroom windows were near tried everything to resist the installation. The original location was going to be on the theater department, but they didn’t want the association. And most everyone else didn't want to be kept up at night by a flashing “LUST” sign. So the project was postponed until the Structural Engineers were like hey, you can use our building, and saved the day! 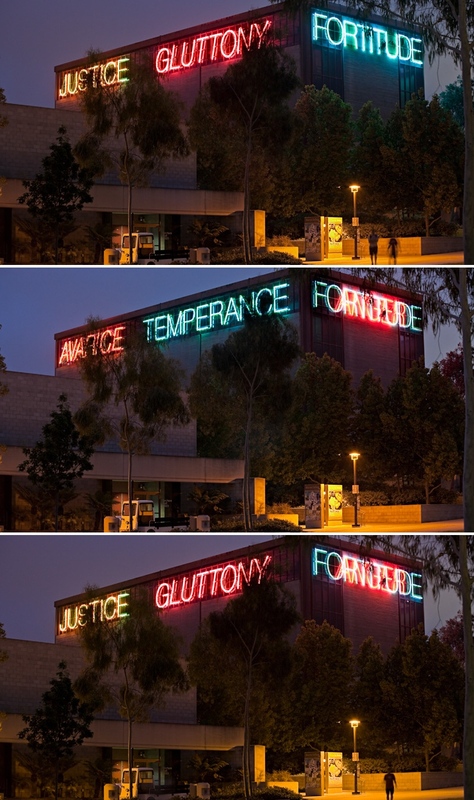 "Bruce Nauman - Vices And Virtues." Stuartcollection.ucsd.edu. Web. 17 Oct. 2017. "Venice Is Doubly Enamored Of Bruce Nauman." Latimesblogs.latimes.com. N.p., 2009. Web. 17 Oct. 2017. "Vices And Virtues | Public Art Archive." Publicartarchive.org. Web. 17 Oct. 2017.